"The sustainable architectural culture that aspires the coexistence of human, nature and the architecture itself" is a core value of Heerim Architects and Planners in South Korea, the team behind a sparkling orb designed for Santa Monica Pier. 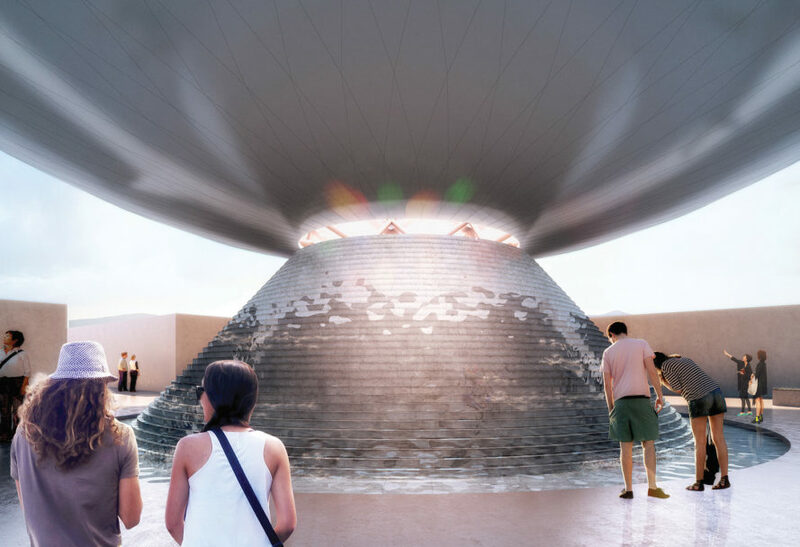 A finalist in the biennial site-specific 2016 Land Art Generator Initiative design competition, which promotes the uptake of energy-generating public art that informs, delights, and uplifts communities and visitors, The Clear Orb reveals a playful approach to holistic design. Using transparent luminescent solar concentrators, the installation is purportedly capable of producing up to half-a-million gallons of fresh water each year for California. The Clear Orb is designed to be accessible from the Santa Monica Pier via the beach boardwalk. 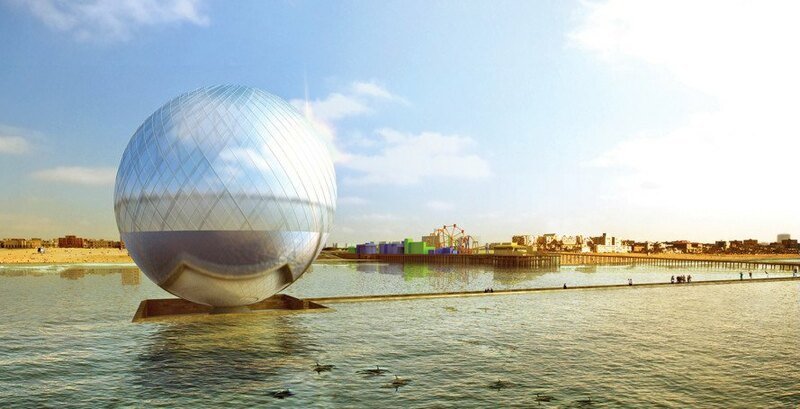 The pathway to the gleaming sphere gently tips toward the water’s surface, the outer walls harvesting wave energy from the existing breakwater. The inner walls depict a list of animals that have gone extinct, inviting visitors to reflect on humanity’s impact on its fellow inhabitants. Energy produced by the oscillating water column along the “contemplation walk” would supply further power to the solar distillation pumps and the grid, though, compared to some of the other designs we’ve seen this year, such as The Pipe, the design’s energy and water production goals are relatively small. 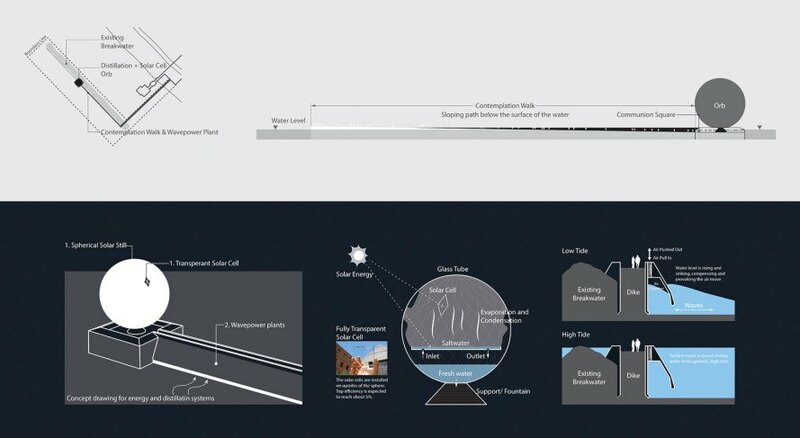 For example, The Pipe would be able to produce 1.5 billion gallons of water for Santa Monica, while The Clear Orb would only have capacity to generate 3,820 MWh solar energy to distill 500,000 gallons of water. Still, if a primary goal of the design competition is to educate the community and visitors about sustainability, The Clear Orb definitely has potential to bring the conversation mainstream. A frequently-visited site, the Santa Monica Pier would be forever transformed with such a vibrant work of art – demonstrating that energy and clean water production can complement the city, both here and abroad. The Clear Orb deploys solar and wave energy to produce drinking water for Santa Monica. The Clear Orb is a finalist in the 2016 Land Art Generator Initiative design competition organized with the city of Santa Monica. The Clear Orb designed by Jaesik Lim, Ahyoung Lee, Jaeyeol Kim, Taegu Lim from South Korea. The design marries public art and energy generation in a playful, contemplative manner. Technical diagram of the renewable energy sources deployed to produce clean water.